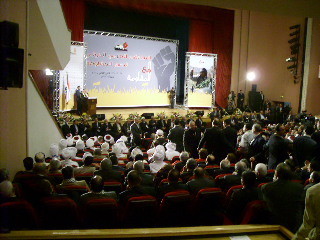 The Conference on resistance, 15-17 January 2010 in Beirut. The conference concerning the resistance, held in Beirut from the 15th to 17th January 2010, was an overwhelming experience for me personally with its almost 10 000 delegates from all over the Arab world and a small number from Europe and the US. It was indeed a great honour for Sweden to have a delegation of four. 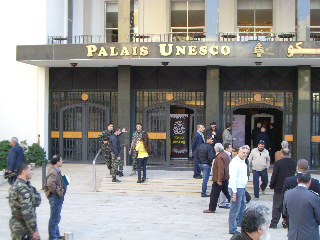 The conference opened at the UNESCO Palace where the leaders of Hezbollah, Hamas and Iraq’s armed resistance, in that order, held introductions that set the tone for the conference. 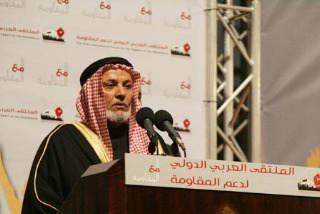 Prominent religious Muslim leaders and representatives of Syria’s government also spoke. It was a powerful manifestation of unity against the politics of Israel and the US and, with no name mentioned serious criticism of Egypt, and open praise for Iran. Introductory speech in the lecture hall. Those dressed in white are the Sudanese. 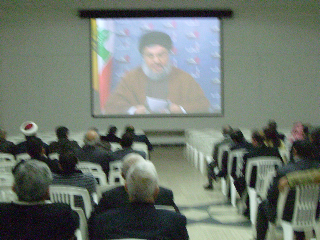 The leader of Hezbollah, Hassan Nasralla, for security reasons talking on video, here in a room adjacent to the packed lecture hall. This was my first visit to Lebanon. 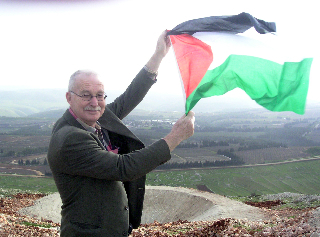 Nearly fifty years ago I was only able to glimpse the country from the Israeli side, it was then enemy territory to me. I lived in Israel for a few years searching for my identity. At that time, the Jewish state was part of my identity and I contemplated staying there. Here I was again, surveying enemy country, only this time from the opposite side. Now I wholeheartedly support the Palestinians’ resistance and their right to return home in accordance with FN resolutions. In fact, I go even further. I believe that the whole of the Jewish settlement state is illegitimate and should therefore be returned to its rightful owners who should decide which settlers stay. 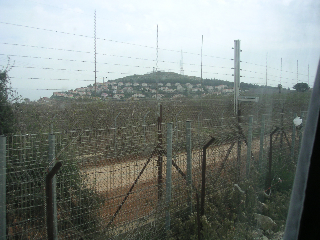 The border with Palestine showing an Israeli kibbutz on the hill. On the second day of the conference, I took part in a seminar where representatives from most of the countries that have liberated themselves from colonialism told of their experiences. 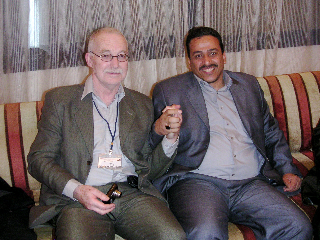 I was particularly struck by the fact that none of the liberation movements agreed to disarm as a condition for peace negotiations, and that historically recognised, justifiable struggles for liberation such as those in Palestine, Iraq and Afghanistan are today called terrorism by the western world, though nothing in the armed struggle has actually changed and it is still protected in human rights law. A journalist from Syria’s largest daily newspaper who interviewed me asked especially why I, in connection with my work for the Palestinians, had abandoned my Jewish identity. I replied that as a Jew I felt guilt about the treatment of the Palestinians because it is carried out in the name of all Jews. I converted guilt into responsibility by taking up the political cause for the dissolution of the Jewish state. Thus, as I have never been a religious person, the grounds for my identity as a Jew ceased to exist. I then urged all diaspora Jews to distance themselves from the Jewish apartheid state, mainly for the sake of the Palestinians, but also for their own, as they otherwise risk being held to account for Israel’s crimes on the day of reckoning. I also had the opportunity to talk with leaders for different Palestinian organisations from the refugee camps in Lebanon. They were very keen to stress their close collaboration with Hezbollah and Hamas, that they had open minds and that they were Islamists. I now have a standing invitation to visit the refugee camps and they will be my guides. 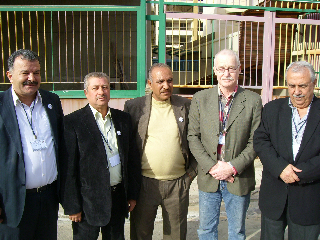 Lasse Wilhelmson with leaders for different Palestinian organisations from the refugee camps in Lebanon. It should be said that Palestinians in Lebanon are not permitted to buy land or houses, or to work outside of the camps; they cannot become Lebanese citizens, and as stateless persons they have fewer rights than the Palestinians living under the apartheid laws in Israel. They cannot launch armed attacks against Israel without permission because Hezbollah controls the whole of southern Lebanon and the border. However, Hezbollah wholeheartedly supports the Palestinians and tries to improve their situation in Lebanon. But Hezbollah is not a Palestinian liberation movement. It is a national Lebanese movement that governs in coalition with others, and has successfully defended its country against Israeli attacks. Along the road that borders Palestine, there are pictures of martyrs from the latest war and of Hezbollah’s leader, Nasrallah, and loot. Special permission is needed to travel on this road. 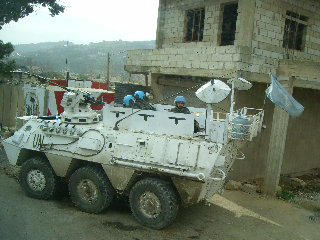 We passed several UN outposts. Our caravan of buses and cars from the resistance conference was on its way to the top of a hill at the entrance to the Beqaa Valley and the border to the country of Palestine. We had a break there and visited a large open-air establishment with a restaurant, probably built by Iran because only the Iranian flag was flying. Viewing the terrain south of the Litani River in Lebanon with its mountains and deep valleys and narrow winding roads, it is easy to understand why Israeli tanks encountered great problems in comparison with Hezbollah’s small, easily moved units in the war of 2006. The entrance to the Beqaa Valley with Palestine to the right. 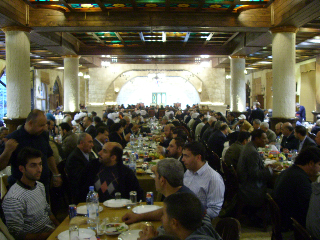 One of several large rooms and a tasty meal on the way back from our excursion to the border with Palestine. While I felt very happy about the generous support given by all to the Palestinians, I could not but help realise that their chances of liberating themselves, especially through military struggle, are smaller than ever today, not least because of the rift caused by Abbas’ s collaboration with Israel. Considering the Wall, the sectionalised West Bank and the crowded flatlands of the Gaza Strip, the odds of winning an armed struggle against one of the world’s most powerful military forces are very bad. I therefore believe that a prerequisite for the liberation of Palestine is that Israel’s influence on US foreign policy must stop, and Zionism’s hold over the media in the western world must end. 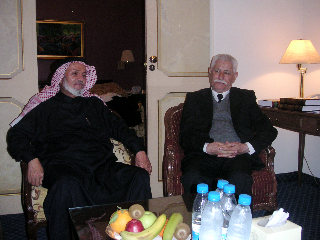 Sheik Dr Mohemmed-Nemer Zaghmout President, Palestinian Islamic Council Lebanon/Overseas and myself. In my discussions with religious leaders, I was astonished not only by their vast general political knowledge and insight but also that they were so keen to distinguish between Jewish settlers, Jewish leaders, ordinary diaspora Jews and the Jewish mafia in their struggle against the Zionist enemy. I had the feeling though, that they do not really understand that most people who identify themselves as Jews are actually secular and to them the line drawn between Judaism and Zionism is indistinct. The Swedish group had a long, specially arranged interview with Dr Sheik Hareth Al-Dari, spokesman for most of the Iraqi resistance and general secretary of The Association of Muslim Scholars in Iraq (AMSI). He lives in exile in Jordan, together with his closest colleagues. A delegation from AMSI visited Stockholm in the spring of 2009, a visit I helped plan and implement. I conveyed my warmest greetings before I asked some questions about how we might improve our support of the resistance in Iraq. I pointed out that the delegation had encountered marvellous weather and warmth that probably did not correspond to their expectations of Sweden. Al-Dari replied that given such a warm reception, even snow and ice would have melted. 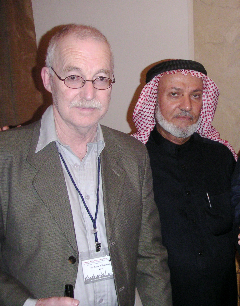 Dr Sheik Hareth Al-Dari (AMSI) and myself. He said that the resistance continues with unimpaired force, but that information on the web has been scarce due to resistance websites being hacked into by the enemy. Al-Dari was eager to point out that all tribes/families in Iraq consist to a certain extent of both Shia and Sunni and that the absolute majority of the people are against the occupation and also critical of Iran’s interference. A small amusing example of this is that the now world- famous journalist who threw his shoe at President Bush was a Shia Muslim. His brother was present at the interview and can be seen here with me. The shoe thrower’s brother and myself. Most of the armed resistance fighters, however, are Sunni Muslims. Up until now it has been difficult to enrol Shia Muslims. According to Al-Dari this is partly because, before the invasion, the US bargained with certain Shia leaders promising favours if they did not resist, partly because Shia leaders in southern Iraq keep postponing their promises to start armed resistance. I myself believe the fact that the Quisling regime is dependent both on the occupation powers and on Shia-governed Iran makes it difficult to enrol Shiites in the armed resistance movement. The Quislings’ foreign minister and all their foreign ambassadors are Kurds and this also favours the occupiers’ attempts to divide the country. Al-Dari was keen to point out that the picture, promoted by the occupation powers, of the division between Sunni and Shia is greatly exaggerated, and that it is the occupiers themselves who are responsible for the terror against civilians and often they who perpetrate it. Al-Dari concluded by stressing the Muslim duty to resist and the importance of national unity against US warfare – which in actual fact is primarily a war for Israel, I added and received a nod and a wide smile for an answer. 1. Final declaration of the conference. 2. Revoking Israel´s UN Membership. 3. Gaza and the Diaspora Jew´s Responsibility. 4. Lasse Wilhelmson on the war on Lebanon 2006. 5. Iraqi Resistance According to the Iraqis Themselves, by Snorre Lindquist.